Sometimes a picnic blanket is just not going to cut it. Do not get me wrong, when accompanying loved ones for a romantic picnic or even when taking your small family out for a fun filled day with a few snacks, the picnic blanket is THE picnic essential. When you have painstakingly produced what equates to a picnic banquet, the picnic blanket is not going to cut it. Equally, if you’re out and about with elder family members, a large group of friends, eating out when temperatures are not ideal, then I’m afraid the picnic blanket is not going to cut it. This is when we turn to the trusty picnic table. As well as allowing guests the luxury of eating in a semi-formal manner a picnic table enables us to do a whole lot more. Food and drink, theoretically, can be stored on an even surface and should avoid spillages. It can be used as an arts and crafts station where the kids can create, draw or color to their heart’s content. It can also provide shade for us by way of a parasol that helps keep us out of the sun. Or, if so required, can be used as a makeshift post to secure your dog’s leash to. What therefore makes a good picnic table and what should we avoid when making our choices? To answer this question I would suggest it would all depend on where you intend to use it. There are obvious flaws if your aim is to have a fully portable picnic table. There are definitely some brilliant folding picnic tables which you can take on a day out. But you must have the room available in your vehicle to transport such an item. If you do have this room then you will want to make sure the table is easy to assemble, is durable and can handle constant assembly and disassembly. And is lightweight enough so as no hernias will be caused. If you are thinking of buying a picnic table for your backyard then there are some other factors that you will want to take into consideration. The table might well become a permanent fixture. So you will definitely want to make sure it is suitable for all weather conditions. Is it likely to become faded by the sun? Will damp or rainy conditions cause it to rust? Is it heavy enough to withstand the windier days you will encounter? All these things must be weighed up and of course, sometimes the answer is going to be negative. But there are certain things that we can do to counter these afflictions. When we leave anything outside to brave the elements alone there will be some natural wear and tear. Sunlight can fade your picnic table due to a mixture of UVA/UVB rays, infrared radiation, and visible light. To prevent this from happening to your tables you can apply covers such as this which will be suitable for wooden or plastic tables. If this seems a bit unsightly in the summer months then you can always apply a good quality varnish that contains UV filters that protect from the sun. One of life’s true bugbears is a rusty hinge or bolt. It looks ugly and in the case of folding picnic tables, can hinder you from smoothly collapsing it down. There are many ways you can prevent the onset of rust on any hinges, bolts or screws, not least using a cover as suggested above but I prefer to use a spray of fluid film. It is mainly used for automotive and marine purposes but has crossed over as an anti-corrosive solution around the home and garden. Not too much science or chemistry behind this solution. If your table is somewhat light, maybe because it’s a kids picnic table then you will need to weigh it down. In most cases I would suggest a weighted parasol base, with said parasol attached should do the trick. In extreme cases though I would use a tarp to cover the table and weigh it down with sandbags. So how does this all translate into actually buying a picnic table? Well, below you can find what I feel is the best in differing categories when it comes to your purchase. 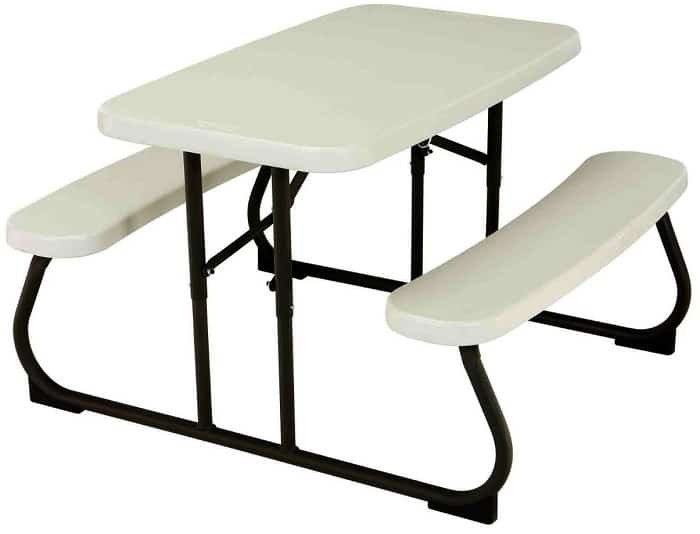 The 280094 Kids picnic table by Lifetime Products Inc is quite simply the best picnic table for kids that there is out there. It stands at 32.5” high and is made with high-density polyethylene which has the added bonus of UV protection. The table is also stain resistant. So no matter what food or paints or crayons your child throws at it you will be able to wipe it clean. It can easily seat 4 kids. But the best thing about the table is that it folds down. This makes it an easily portable picnic table if so required. If not then storage is easy in your garage or closets. Lifetime comes up trumps again with the 60054 convertible bench / table. As the title suggests, this ingenious beauty doubles up as both a table and a bench. You can save space with this hybrid by putting it into park bench mode. But when the food and drinks arrive all you need is one swing of the backrest and, voila! One bench and one table all built into one multipurpose frame. The table’s design uses faux wood. So, you do lose a bit of authenticity but this does mean it’s easier to maintain. If you’re like me, the thought of actually creating something yourself from scratch is appealing. If you’re like me, the ability sometimes does not meet the ambition. I read picnic table plans and come to the realization that I have neither the skill nor time to accomplish what lay before me. 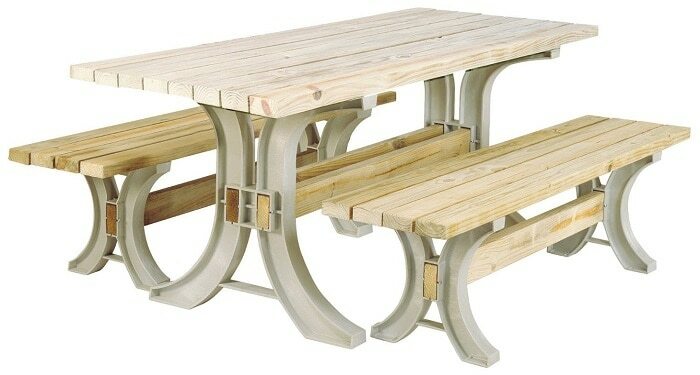 For this reason, the Picnic Table Kit by 2×4 Basics is an interesting prospect. The frames are already provided but do need assembly. Best of all, to make it feel like this is all your creation, you must provide the 2×4 to complete the project. This leads to untold possibilities when it comes to design. And you can really get into it without, let’s face it, not actually doing a lot. Perfect! They also do a hybrid version like the item above from Lifetime where you could now add some real wood instead of the faux variety. Folding picnic tables have a reputation as being flimsy and for the most part, this is true. I think it’s because companies insist on making them all-in-one items so the table and benches are all one piece. This inevitably leads to flimsiness as it becomes a designers nightmare as to how to compact all the elements down into something that can be carried away and stored conveniently. The Portable folding outdoor picnic table with four separate seats by Outsunny laughs in the face of these problems though. Even though there are five pieces here everything folds up into one space. You can now enjoy picnics in the park with your very own, easy to transport picnic table. The table itself features adjustable height settings and is made from high-density polyethylene and aluminum.